Last year, I shared a post about how I was decluttering our home and becoming more intentional about bringing *stuff* into our family’s space. Less stuff meant less time spent organising, cleaning, and being distracted from what was really important. It was liberating! I found that limiting our possessions to what was truly useful and loved was so much better than having excess stuff that cluttered our lives – both physically and emotionally. Since then, I have been doing a lot more research into minimalism and our family has been inspired to take the concept of “simple living” more seriously. My Simple Living Series shares tips for simplifying, categories of *stuff* with ideas for decluttering, and/or advice about living more intentionally. 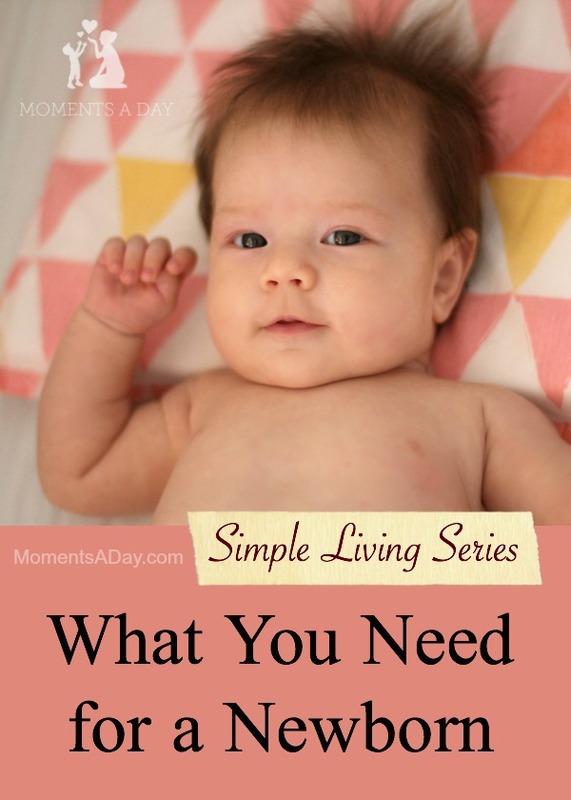 In this post, I’m sharing my personal list of newborn essentials. Preparing for a baby the first time around was quite stressful for me. There were so many products out there and I had no idea what was really necessary. I spent a lot of money (and got a lot of gifts) for stuff I “needed.” So many items ended up hanging out in my closet or stored in a box somewhere yet I never missed them. For my second baby, I held onto a lot of the stuff just in case I would need it… some of it I used, most of it I didn’t. By my third pregnancy, I had accumulated so much baby gear that it was slightly ridiculous. I had received so many bibs, toys, baby plates, random bits and pieces, and it just wasn’t necessary. I decided to only keep my favourite items and gave the rest away to friends and charity (much was only lightly used, if used at all). Baby is now 12 weeks old and we have gotten by absolutely fine without it. After trying out tons of baby products, here is my life of “must-have” items covering baby’s life for the first 3 months. This one seems obvious, but it can be surprisingly overwhelming to visit the store and see just how many carseats there are on the market these days. There are a number of carseats you can buy nowadays that suit newborns up until they are toddlers/preschoolers, or you may choose to first buy a capsule (especially for newborns) then move to a traditional carseat. The benefit of a capsule is that if baby falls asleep in the car you can take them out in the capsule without waking him/her up, and the capsules sometimes even fit onto a pram (or a stroller frame) – so it really depends on your lifestyle whether you would be using these features. If you want to just buy one item, go for the carseat and skip the capsule. Again, seems obvious, but there are many factors to consider when choosing which clothing and how much clothing to buy. Firstly, how often do you do the laundry? If you already do it quite often, you will need fewer clothes. Also, do you care of the clothes are new? If you want to cut down on buying stuff directly from the store, tell relatives and friends you don’t mind second-hand clothes and would even prefer them since baby will be wearing them for only a few short months. Furthermore, all those cutesy outfits really are not necessary. Basic onesies and PJ type clothing (with footies included, because socks always fall off babies!!) are really all you need – plus a sweater, jacket, and hat (and one “nicer” outfit per size, if you want to take photos). I personally loathe two set suits (i.e. a separate shirt and bottom) because the shirt always ends up half way up the baby’s chest! I say babies are only babies for so long… they may as well be as comfortable as possible! Depending on your lifestyle, you may use a cot (AKA crib) or not. We have a co-sleeper and after that, baby will likely sleep in our bed before moving on to a toddler bed – so we don’t have a wooden cot or traditional porta cot. As for keeping warm, a few swaddles are great. I also have the No Sweat All Seasons Baby Quilt Set for an extra layer of warmth. I love it because it can be used year round (it has a heavier insert for colder months) plus it has special moisture control features to regulate temperature. This bed set also fits a co-sleeper or cot and a toddler bed, which is a big bonus. I love bright cheery colours and modern design of this set as well, and will be happy to use it for my infant up until she’s grown out of the toddler bed around age 3 or 4 – unlike some of the more cutesy styles that are really only for babies. In the photo above my bub is sleeping with the quilt plus the Optimal Baby Pillow that goes with it. It’s not absolutely necessary to have a change table, but it is nice to have an area dedicated to keeping your changing supplies. I also have a basic change table with a changing mat plus two mat covers. I have about 20 reusable nappies, cloth wipes (sitting beside an old ice-cream container which I fill up with water for getting them wet), two wet bags for going out and holding the dirty nappies, and some nappy rash cream. My favourites are an Ergo style carrier with an infant insert, or a ring sling to use when babies are really small. There are so many baby carriers out there so it can be tempting to try them all. 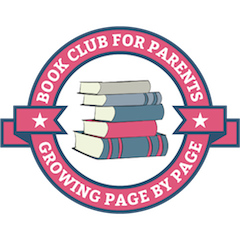 Find a local baby wearing club in your area so you can test out a few carriers and find out what people like about each one before you make multiple purchases. One or two is enough, in my opinion, so choose a colour or pattern that you will like for a long time. These are really useful, especially in the first few weeks when you are getting used to breastfeeding (even with a second or third child, the experience can be completely different!). The Optimal Multi-function Maternity and Breastfeeding Pillow is the absolute best because it doubles as a pregnancy pillow (supporting your tummy when you are sleeping), and can also be used to help baby with sitting when he or she is older! I love the height and firmness of the pillow, and you can also get extra pillowcases in the inevitable case of milk or spit up getting spilled while baby feeds. The old style cloth nappies (prefold cloth diapers) are the most practical burp cloths in my opinion. I love them because they don’t take up much space (in storage or in the laundry) and yet the padding can hold quite a bit of mess. If your baby does spit up a lot, you may also want four or five basic bibs (again, depending how often you do laundry). I prefer the soft styled ones for little babies (no plastic backing) and a snap on the side of the neck versus in the back. Two small blankets for floor play (one for the floor, one for the laundry) plus a small quilt for outdoors. It’s also nice to have a lightweight blanket in your bag to use on outings. Although a blanket is fine for baby to rest on for some of the day, I find a bouncer is also nice for keeping baby upright so she can see what’s going on during those early months. I have a Valco VeeBee Serenity Bouncer because it’s simple – I personally don’t like all the crazy colours and toys and music and vibrations that come on other bouncers. I keep our bouncer in the kitchen so bub can watch me preparing lunch boxes in the morning and cooking dinner in the late afternoon, and sometimes I even bring it into the bathroom when I need to take a shower and she’s not asleep. She loves looking at the patterns on the shower curtain! Babies can bathe in a deep kitchen sink or in a bucket, but second-hand baths are not hard to come by and they can be very useful… even later on for toddlers who love water play. Newborn babies need a lot of support, so holding them in a bath can be tricky, therefore I have also found a bath support incredibly useful. I have an Infa-Secure Terri Bath Support (I’ve used it for all three of my babies!) but there are many kinds out there that would work fine. Regular towels can be used however baby towels tend to be a bit softer and because of their shape (square with a hood) they make it easier to wrap the baby to stay warm after a bath. Baby wash clothes are nice, as well, because they are very thin and make it easier to wash baby. (Just a tip: keeping a wet washcloth on baby’s tummy while you are washing her head keeps her warm.) I used our baby wash cloths as wet wipes for toddlers at the table (i.e. they would get a wet baby wash cloth instead of a napkin during mealtimes and snacks) which made them a worthwhile product, as well. A simple play mat with a few hanging toys for baby to look at, one or two lightweight good quality wooden teethers/rattles, and a mobile (ours is on our change table – visit this page for some DIY templates) is fine for the first three or four months. If you already have a child (or children! ), what would you add? Or change? Definitely a nursing pillow!!! I also used Ergo and absolutely loved it! I found nursing rocking chair very helpful, especially for those who feed on demand. Great list! Love our baby carriers – have definitely been the best thing we’ve bought for our babies! Great list! I think I had so much more than I needed the first time around. 4th time I don’t think I’m buying anything extra, LOL. I love the idea of using washcloths as wet wipes for toddlers! We have a 2 1/2 week old, our first little one, so I’ve been learning which items I appreciate having and which I could have done with out. I’m thankful to have lots of burp cloths! I’d add nursing pads, though those are for mama and not the newborn, lol. I have both reusable washable ones that I like to use at night, and disposable ones that I like to use when going out because they’re less bulky and not as noticeable under clothes. I was also surprised by how much we love a hand me down Boppy Newborn Lounger that a friend gave us. It’s great for our LO to lounge in while propped up on our laps, or to rest in next to me on the couch. I also prefer onesies to two piece outfits (as adorable as they may be) for the same reasons that you mentioned. I completely agree! I bought waaay too much for my babies and if I had my time over, would have ditched more than half of the gadgets I bought. Are kids were born in quick succession so we ended up with double of everything too. SO MUCH STUFF!!! Thanks for putting it into perspective. Sleep sacks were fantastic with our bubs! Brilliant list and would be so handy for first time mums. Such a wonderful list. I got sucked into buying so many unnecessary items with my first born. The one item I could not live without was my rocking chair. I spent so much of my time in it feeding my babies and then it became our reading chair where we would snuggle together and enjoy a story. I only recently gave it away and it was very hard to part with. So many wonderful memories. One of the best article about newborn essential. Cloth diaper is one of the essential. At first, I was new to cloth diapers. After getting in-depth knowledge about it took a great step in my children life. I am using cloth diapers for both of my children. Cloth diapers are reusable diapers in India and from anywhere in the world, I purchased Cover diapers, Pocket diapers, AIO diapers. https://www.atoddlerthing.com which is a baby diapers shop in India. Buy baby diapers online from anywhere around the Globe.